In earlier versions of SCCM, customizing your inventory involved hand-coding MOF files and then replacing critical files in your SCCM installation directory with these. Even though SCCM was quite smart about parsing these and ignoring invalid files, this still scared most people off even attempting such things and thus custom inventory classes were sadly almost never used in production environments. In the following window, click on “Add…” then on “Connect…” and enter the name of a PC that you have already run the script from part 1 on. You will then receive a list of the WMI classes available for collection on that PC, one of which will be our newly created one. Select the MonitorDetails class for collection and press OK three times. You can now either wait for the settings to take effect on your systems – which may take days depending on your hardware inventory cycle – or you can speed this up by first doing a Machine Policy Retrieval & Evaluation Cycle, waiting a few minutes for that to take effect, then follow up with a Hardware Inventory Cycle. Our collected data showing up in resource explorer. You will also get a new View in your SQL database called v_GS_MonitorDetails that you can query for reports. In part 3 of this guide I will show you how to create a report to display this collected data. 25 Responses to "Collecting custom WMI classes with SCCM"
Is it part 3 available now…I need it urgently..
Hello friends, I implemented the solution, but I have a question, a team LENOVO, and tells me that your monitor is DELL 2208WFP not understand what happens. please help. Can you try the debug version from http://exar.ch/files/get-monitor-details.ps1 and write what output you get from that? First off, thank-you for the script! It helps fill a void I was facing. Secondly, I’ve already posted this comment under PART 1, but I realized that my question should have been asked here first as it is inventory related. Sorry for the duplicate post. I am having an issue and I’m hoping you’re able to help. I’ve downloaded the script and executed on my local workstation. I can run “get-WMIObject MonitorDetails” and see the class but I’m unable to browse and see the class using Scriptomatic or WMI Code Creator. Any thoughts on where I went wrong? I have already modified the Hardware Inventory, and can see the class in my local ‘InventoryAgent.log’… but obviously nothing is going to be populated into the database if the values and class don’t exist on my local machine. Hopefully I’ve missed something easy and you can help point me in the right direction. I’m also waiting for the part 3 “generating a report”? Is it available yet? Yeah sorry the delay got a bit embarrassing… I added the next part now. Thanks for usefull article and experience. I have a issue: Resource Explorer doesn’t show a new class after HV inventory cycle. I checked that class installed on PC and View in SQL database also exist. What may cause of such beahivour? Hi. Same issue here. The class is not showing up in Resource Explorer. 1. The script didn’t run correctly from the SCCM package, so it didn’t create the WMI class and Object. The solution: I had to use the correct parameters for powershell to run the script. The package is set to be downloaded to the client, and the Program is set to run with administrative rights. 2. The information didn’t appear in SCCM Hardware inventory. The solution: I had to untick MonitorDetails, click OK a couple of times, wait 5 minutes, then tick again MonitorDetails, click OK a couple of times, in Hardware Inventory Classes. This regenerated the client policy, and the information started to appear in the system. I don’t know why it didn’t work right after I imported the class, but this solved my problem on the next day. So, data started appearing in SCCM, and I am happy. I was able to successfully deploy the script to one machine and add the class to Default Client settings. I’ve also tried updating machine policy and hardware inventory but I’m not able to see the Monitor info in resource explorer. 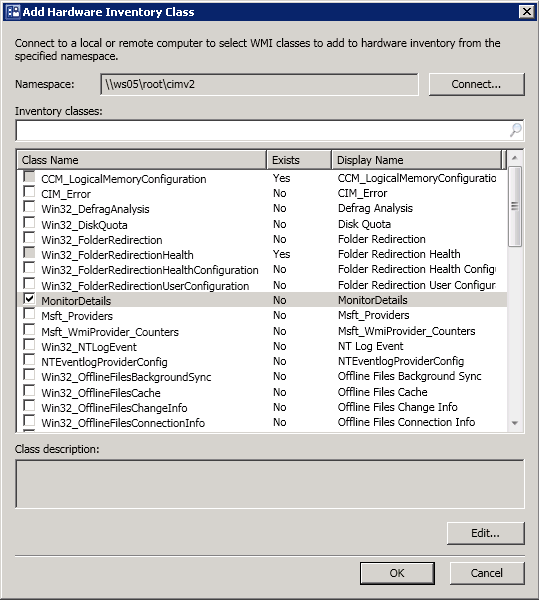 Can you display the WMI class on the PC locally by using “get-wmiobject MonitorDetails”? If yes, the script is working, but you may need to wait for the hardware inventory task to complete. I noticed that it sometimes takes a few days for SCCM to update the hardware inventory. Yes, the script works. I’ll give it a week and i’ll let you know if it worked. Waited for two weeks but it didn’t work for me. Worked for two other machines though. Can you try guiding me in the right direction to troubleshoot the issue in order to get it working? Really excellent script, thank you very much! I was wondering – is there a way to make SCCM save the display history? If a user gets a new monitor for example, is there a way to collect data about that user’s previous monitor as well as the current one? Thank you so much. This worked perfectly!!! I’ve tried everything here and it works like a charm. Only issue is that we have computers with more than 1 monitor. When checking the WMI Class we’ve created I am able to pull two monitors (instances), but in the Hardware Inventory that SCCM is collecting for some reason I only see one. SCCM should collect all instances if multiple ones exist on the PC, much like it does multiple hard disks etc. Try looking in the v_GS_MONITORDETAILS view in the SCCM database, they should be there. How did you see only one instance? Was it out of a report, or Resource Explorer? I have also the problem that there is nothing in the Resource Explorer. I waited 2 days but still nothing. Do you know what that could be?